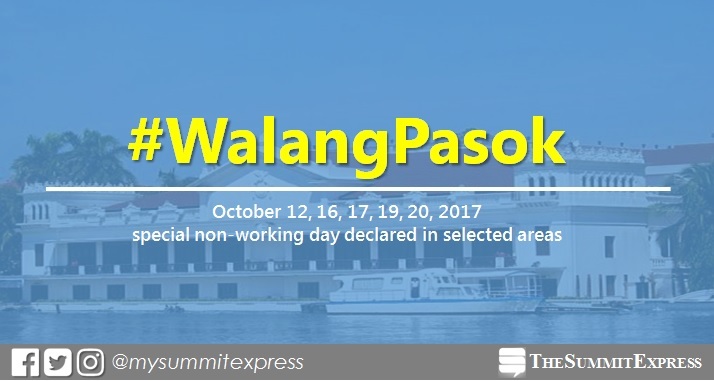 MANILA, Philippines — There will be no classes and work in selected areas for the specific dates of October 2017 (12,16, 17, 19, 20) to give way for the celebration of local events, Malacañang Palace declared. Proclamation numbers 317-318 declare special non-working day in the following areas: Quinapondan, Eastern Samar and Pigcawayan, Cotabato, respectively. Meanwhile, Republic Acts 7350, 7677, 7724 and 1745 automatically declare specific date of the year (October 2017) for the observance of special occasion in several areas. Republic Act 7350: The law declares October 12 of every year as a special non-working holiday in Zamboanga City for Fiesta Pilar, the day will be devoted to religious activities honoring the La Virgen, with the Fort Pilar Shrine as the center of activities. Republic Act No. 7677: The law declares October 16 of every year as a special non-working holiday in Oroquieta City for the cityhood celebration. Republic Act No. 7724: The law declares October 19 of every year as a special non-working public holiday in the City of Bacolod to be known as ‘Bacolod City Charter Day’” which was approved by then Senate President Edgardo Angara, House Speaker Jose De Venecia, Jr., and former President Fidel Ramos on May 19, 1994. Republic Act No. 1745: This regular holiday in the province of Leyte on October 20 is to commemorate the landing of American and Filipino forces in Palo Beach during the Battle of Leyte in 1944, signalling the beginning liberation of the country in the Second World War. Proclamation No. 317: Special (non-working) holiday declared in the Municipality of Quinapondan, Eastern Samar for the celebration of its Founding Anniversary on Tuesday, October 17. Proclamation No. 318: Special (non-working) holiday declared in the Municipality of Pigcawayan, Cotabato for the celebration of 64th Foundation Anniversary on Friday, October 20.